simple software solutions to big business problems. Concurrent = Two queues and one coﬀee machine. Parallel = Two queues and two coﬀee machines. Furthermore, if an engineer optimizes one wall he aggravates the other two. Allows one or more threads to wait for a given set of operations to complete. Can synchronize threads progressing through some algorithm. Not possible to forget to acquire the lock when necessary. Tasks are then submitted to the ForkJoinPool too. Splitting and joining of tasks. Still there are chances of bugs. To predict the theoretical maximum speedup for program processing using multiple processors. Any method of coordinating multiple concurrent modifications to a shared set of storage locations. Similar to garbage collection has displaced the need for manual memory management. Isolate the state and constraint the ways in which that state can be changed. Persistent data structures separate identity from state. Agents work in concert with persistent data structures to maintain the separation of identity and state. the thread of execution that schedules them. I/O and other side-effecting functions may be safely used in conjunction with agents. no direct means to accept it. Agent does not encapsulates behaviour. Agent’s error reporting is more primitive. Unlike refs and atoms, it is perfectly safe to use agents to coordinate I/O and perform other blocking operations. Ideal for guarding a contested resource. Blocking IO. Race conditions among the involved refs. Evaluated within a thread pool that is shared with potentially blocking agent actions. This pooling of resources can make futures more efficient than creating native threads as needed. Using future is much more concise than setting up and starting a native thread. make it easier to interoperate with Java APIs that expect them. We can override their value only within the scope of a particular function call, and nowhere else. Evented servers are really good for very light requests, but if you have long running request, it falls on its face. Coroutines are best of the both the worlds, They can wait as callbacks do. Coroutines wait on socket and if something happens on socket they become runnable. Mathematical model of concurrent computation. Processes - No threads. No shared memory. Fixed number of processes. Two approaches from seventies changed concurrency today. Elixir is written on top of Erlang. Shares runtime of Erlang & can use Erlang libraries. Isolated crashes. Process crash doesn’t affect other processes. Defines systems in terms of hierarchies of applications. State can be accessed at different places within a process or node, or across multiple nodes. Has one purpose. It manages one or more worker processes. Built-in concurrency based on Tony Hoare’s CSP paper. There is default case and timeout case. e.g. for network IO if nothing happens, a timeout will happen. for IO, scheduler will preempt it, it will make resume goroutine once IO is complete. to communicate between channels. It won’t be possible to have go like concurrency. In Java/Ruby, it would be heavy weight thread, Not as performant. A Fiber is a lightweight thread that uses cooperative multitasking instead of preemptive multitasking. much easier than kernel or user threads. A fiber is a unit of execution that must be manually scheduled by the application. Fibers run in the context of the threads that schedule them. Each thread can schedule multiple fibers. using fibers can make it easier to port applications that were designed to schedule their own threads. Fibers are more of a code organization pattern than a way of doing concurrent tasks. Ruby’s runtime guarantees thread safety. But it makes no guarantees about your code. Multithreaded CPU-bound requests GVL is still issue. 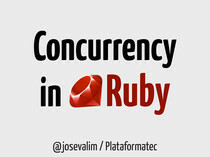 Ruby didn’t have better concurrency abstractions. Future - An asynchronous operation that produces a value. Promise - Similar to Futures, with more features. ScheduledTask - Like a Future scheduled for a specific future time. TimerTask - A Thread that periodically wakes up to perform work at regular intervals. Array - A thread-safe subclass of Ruby's standard Array. Hash - A thread-safe subclass of Ruby's standard Hash. Tuple - A fixed size array with volatile (synchronized, thread safe) getters/setters. Maybe - A thread-safe, immutable object representing an optional value. Delay - Lazy evaluation of a block yielding an immutable result. Based on Clojure's delay. Agent - A way to manage shared, mutable, asynchronous, independent, state. Based on Clojure's Agent. Atom - A way to manage shared, mutable, synchronous, independent state. Based on Clojure's Atom. AtomicBoolean - A boolean value that can be updated atomically. AtomicFixnum - A numeric value that can be updated atomically. AtomicReference - An object reference that may be updated atomically. Exchanger - A synchronization point at which threads can pair and swap elements within pairs. Based on Java's Exchanger. CountDownLatch - A synchronization object that allows one thread to wait on multiple other threads. Event - Old school kernel-style event. ReadWriteLock - A lock that supports multiple readers but only one writer. ReentrantReadWriteLock - A read/write lock with reentrant and upgrade features. Semaphore - A counting-based locking mechanism that uses permits. Actor - Implements the Actor Model, where concurrent actors exchange messages. additional inspiration from Clojure core.async.